Can Going Paleo Help Your Sleep? Being that I am a sleep doctor, one of the things that I found most curious about my transition to a Paleo diet is how much it seems to have improved my sleep. I was never necessarily a bad sleeper, but I find my sleep to be exceptional since my diet change. I fall asleep quickly, which I always have, but it’s the continuity of my sleep that has improved. In the past I would often toss and turn, waking up several times during the night for no particular reason. These days I fall asleep, and the next thing I know my alarm is going off and it’s morning. I feel more refreshed in the mornings and don’t feel the afternoon fatigue I used to have on occasion. My wife has also noticed a difference. For almost two years she used Lunesta to help her fall asleep and she was tired of having to use it. It left her groggy in the mornings and she seemed to just drag all day. Without it she could not fall asleep easily so she used it out of necessity. Once she also committed 100% to a Paleo diet she began to sleep better. She got off the Lunesta and after a week or so of flushing it out of her system, she has been sleeping better than she has in over 10 years. She sleeps well, feels refreshed in the mornings, and has very infrequent awakenings throughout the night. 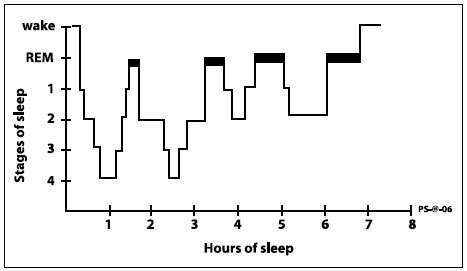 In almost all of my patients that have adapted their diet to the Paleolithic plan I have seen an improvement in sleep similar to our experience. So the question is why? Why does sleep, in particular sleep continuity seem to improve with a change in diet? I’ve searched the medical literature and have found no definitive studies to answer that question. So, I’m going to offer my OPINION on why this may be the case. Let’s look at a couple of things. I discussed in a prior post that a fairly well timed hormonal dance occurs around the time we go to sleep. Cortisol nears its nadir at the time we normally fall asleep, and growth hormone is on the rise during this time. This exchange of hormone levels, along with an increase in our natural melatonin leads to us going to sleep. If these hormones are off for whatever reason, the result can be disjointed sleep. We know that cortisol and insulin are closely tied, so it makes perfect sense that by adapting a diet that lowers your overall insulin levels that will likely have a positive affect on your cortisol levels. Although maybe not completely understood, an interplay between insulin, cortisol, and growth hormone are involved in the improvements in sleep seen with Paleo. Another area that affects sleep is your gastrointestinal system. When you eat a diet full of GI irritants, large meals are bound to affect how you feel. Your sleep is an ever changing state where you move between sleep stages freely throughout the night. Normally the changes in your sleep stages, or stage “shifts” are fairly well timed leading to a fairly small number of overall shifts though out the night. Anything that disrupts sleep such as Obstructive Sleep Apnea or Periodic Limb Movement Disorder does so by essentially increasing the number of stage shifts. This increase in shifts leads to a higher rate of arousal from sleep (aka waking up) and therefore less restful sleep. Any number of things can lead to stage shifts, including any pain or discomfort you may have. Chronic GI irritation from a traditional carb based diet leads to excessive gas, bloating, and cramping that I believe disrupts sleep quite a bit. You do not have to be completely conscious of your arousals, in fact you are not aware of most, but your brain recognizes them and you feel them in the morning as fatigue. I’m sure we all would agree that a Paleo lifestyle has led to much a much calmer GI system…to say it nicely. If we feel better in the day, we feel better at night, and we sleep better because of it as well. Sleep is also very closely tied to one’s emotional well being. One of the most common signs of chronic depression is chronic insomnia. There are two basic forms of insomnia: sleep onset and sleep maintenance. As you may expect sleep onset insomnia is trouble falling asleep, and sleep maintenance is trouble staying asleep. A typical depressed sleep pattern is taking too long to fall asleep due to excessive thinking, and early morning awakening. This early morning awakening can be anywhere from 2-5 AM, and again is prolonged by what I call the “I can’s shut my brain off” syndrome. Once people wake up, they just can’t stop thinking enough about what they have to do or what has happened to them to fall back asleep. A gluten laden diet has been linked to depression in many studies, and many people report significant improvements in their underlying depression or hopelessness by changing to a gluten free diet. Paleo of course is gluten free and then some. It’s not hard to link a paleo diet with improved depression, and improved depression with improved sleep. When we treat depression with traditional antidepressants one of the first thing patients report is a dramatic improvement in sleep, particularly sleep maintenance. If you consider Paleo eating more of a natural antidepressant, then the improvements in sleep are easy to understand. Lastly I think sleep is improved with the Paleo diet basically by association with other aspects of the so called Paleo “lifestyle”. When you decide to go Paleo, you normally do it with the basic intention of getting healthier and feeling better. To that end most do not stop only with their diet. Adapting a new lifestyle also includes increasing your physical activity and focusing on a more overall positive attitude. When you exercise you get tired, and getting more tired in the day leads to better sleep at night. Think of your kids; when they play hard or swim for hours they sleep like logs…we are the same! Over the next few months, try to focus a little more on your sleep. See how certain things affect your sleep. In particular, notice how any “cheats” may affect your sleep. Some can be a little less compliant and get away with it, but many can’t. Gluten and dairy in particular can significantly affect your sleep, even in small doses. One last thing, what if you are totally Paleo, and still can’t sleep? Paleo can make you sleep better, but it cannot treat or cure many sleep problems. Insomnia is not to be taken lightly, and can be a significant medical issue requiring sleeping pills to treat. From Restless Leg Syndrome to Delayed Sleep Phase Disorder, sleep disorders are real and are not always treatable “naturally.” Likewise, depression is a pervasive and life changing illness that often requires medication to manage. If you feel depressed despite a Paleo diet, or you can’t sleep, or both!, please do not feel “ashamed” or “weak” in any way by seeking appropriate care and treatment from a health professional. Don’t lose another night of sleep worrying about it.